Summary: Teaching kids how to read graphs and charts? Want to wow kids (or adults) with amazing animal facts (the biomass of termites is twice that of humans; the pistol shrimp makes a sound that’s louder than a jet plane taking off)? This book has you covered on all fronts. 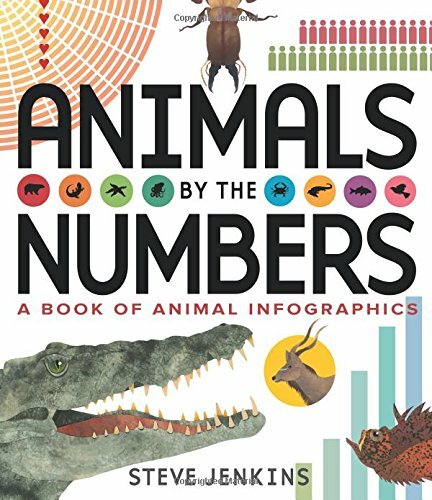 Looking at many different aspects of animals, including life spans, speed, size, and deadliness, every page has a different infographic that brings the information to life. The sobering last few pages graph the winners and losers of mass extinctions of the past, including one that is going on right now, and chart the numbers left of some of the most endangered species. Additional books and websites are listed at the end. 48 pages; grades 2-6. Pros: You won’t hear much from any child you hand this book to; he or she will be way too absorbed studying the graphs and charts on every page. That reader may emerge on occasion to share some fascinating fact with you (a koi fish can live 226 years! There are 20 times more spider and scorpion species than mammals!). I’ve already raved about Steve Jenkins’ cut-paper illustrations enough times to fill a pie chart, so I’ll spare you another round. Cons: It’s hard to believe those pesky squirrels in my backyard sleep twice as many hours as I do.